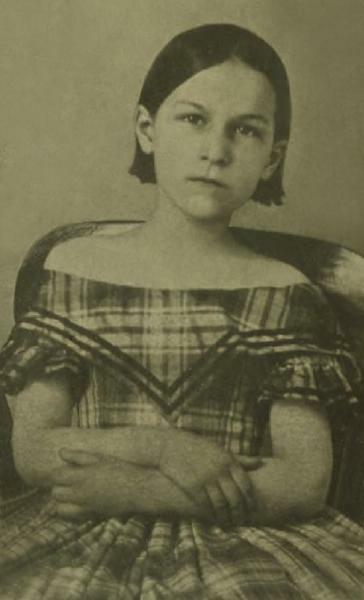 Sara Olivia Pegues was born on 6 December 1848 in Marlboro District, South Carolina. Benjamin Franklin Pegues and Sarah Ann Wilds Gillespie appeared in the US federal census of 1 June 1850 in Chesterfield District, South Carolina, enumerated next to next to Benjamin's brother William.. Other members of the household included Sara Olivia Pegues, Julia Mary Pegues, Lucy Pegues, Harriet S. J. Pegues and Nannie Gillespie Pegues. Also in the household was overseer W. C. Knight. Benjamin Franklin Pegues and Sarah Ann Wilds Gillespie appeared in the US federal census of 1 June 1860 in Bennettsville, Marlboro District, South Carolina. Other members of the household included Sara Olivia Pegues, Julia Mary Pegues, Lucy Pegues, Harriet S. J. Pegues, John T. Mason, Nannie Gillespie Pegues, Mary Elizabeth Pegues, Ella Lee Pegues, Martha S. Pegues, Sue Sparks Pegues and B. Frank Pegues. She married Rufus Marcellus Pegues, son of Wesley Leatherwood Pegues and Caroline Ann Keitt, circa 1869, first cousins; their fathers were brothers. Rufus Marcellus Pegues and Sara Olivia Pegues appeared in the US federal census of 1 June 1870 in Smithville Township, Marlboro County, South Carolina. Also in the household were two domestic servants and three farm laborers. Sara Olivia Pegues died on 12 April 1889 at age 40. Her husband Rufus Marcellus Pegues became a widower at her death.